Restore vision and make driving safer with the Pinnacle in glass care! The Pinnacle Crystal Clear Glass Kit is designed to clean, polish, and protect your windshield and other automotive glass. Over time, driving your automobile subjects it to conditions that reduce your vision and can make driving dangerous. Road oil, water spots, and environmental fallout create a film on your windshield that ordinary window cleaners cannot remove. 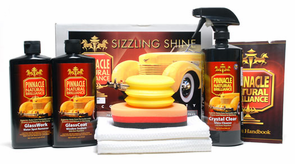 The Pinnacle Crystal Clear Glass Kit includes the right products and applicators to restore like new vision and seal out the elements. Pinnacle Crystal Clear Glass Cleaner with Water Repellent quickly cuts through road oil and soiling, leaving your glass perfectly clean. Clean glass serves little benefit if it is scarred with streaks. Pinnacle Crystal Clear Glass Cleaner with Water Repellent is easy-to-use. With every mist, the included Waffle Weave Glass towel will effortlessly glide across the glass cleaning away oil build up, smoker 's film, grease, grime, and day-to-day soil. In addition, the water repellent nature of Crystal Clear Glass Cleaner promotes water beading, keeping your glass clean and maintaining your vision in rainstorms. Pinnacle GlassWork Water Spot Remover restores clarity to automotive glass. Over time, scale and mineral deposits build up on the exterior glass of your automobile, reducing clarity and negatively effecting wet weather vision. Pinnacle GlassWork Water Spot Remover combines citrus-based mineral dissolving agents and micro-fine abrasives to lightly polish the glass to a perfectly clean, perfectly clear luster. Pinnacle GlassCoat Window Sealant coats your glass with a protective sealant that increases your wet weather visibility, reduces your wiper use, increases optical clarity, and keeps your glass cleaner for longer. It does all this while reducing contaminant build-up. Pinnacle GlassCoat Window Sealant can last up to six months per application although monthly applications are recommended in wet climates. The Waffle Weave Microfiber Glass Towel was engineered for cleaning. Tiny spokes in the individual fibers, too microscopic to detect with the naked eye, lift and trap dirt and moisture, while gently buffing the surface to a shine. Microfiber is designed to never shed lint. Use one towel to spread Pinnacle Crystal Clear Glass Cleaner with Water Repellent and the second towel to buff to a streak-free shine. The Polish N� Wax is a triple layered foam pad with orange light cutting foam on one side and soft, gray finishing foam on the other side. The red layer in the middle gives the pad additional height so you can grip it without rubbing your fingers on the surface. Use the orange side to polish glass to absolute clarity using Pinnacle GlassWork Water Spot Remover. The soft Poly Foam Applicator is perfect for light-duty polishing and spreading thin, even coats of waxes and sealants across any surface. Use a Poly Foam Applicator to coat your glass with a thin coat of Pinnacle Glass Coat Window Sealant with Rain Repellent. Clean your glass thoroughly using Pinnacle Crystal Clear Glass Cleaner and the included Waffle Weave Glass Towels. Next, polish glass using Pinnacle GlassWork Water Spot Remover to restore clarity. Finally, add protection and water beading to the glass using Pinnacle GlassCoat Window Sealant with Rain Repellent using a poly foam applicator. To maintain clear glass and increase water repellency, clean glass often with Pinnacle Crystal Clear Glass Cleaner with Water Repellent. The product really cleaned up my windshield and the other windows. The product performed as advertised.